Euro 2016 is fast approaching, which is probably why NetEnt has been inspired to release Football: Champions Cup. A football-themed slot is hardly new to the online gaming world, but we think this one could turn out to be a favourite for some players. We’ve broken everything down for you here so you have an idea of how good it could be. The Football: Champions Cup slot is a 5 x 3 slot game with 20 paylines. 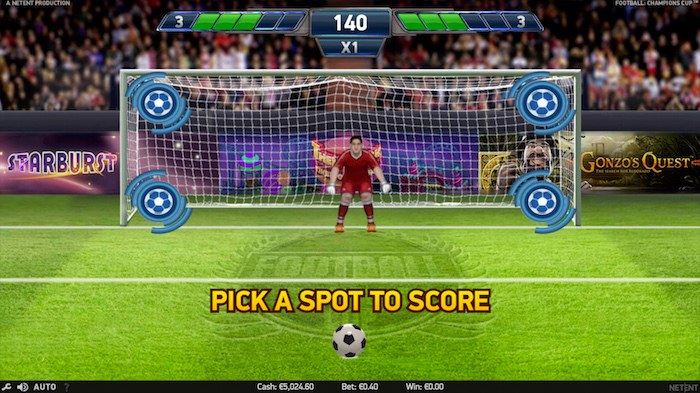 It has a footballing theme and includes the prospect of taking part in a penalty shootout in the bonus round, too. Created by NetEnt, it looks good and plays very smoothly indeed. It has several worthwhile features including a twist on the usual free spins offering, thus making this a very nice football slots game to try. Don’t be put off by the fact this is a 2D game. It has a nice glossy appearance and uses the football theme well in a number of ways. It’s never hard to find a UK football slot online, but NetEnt has taken great care to work in the theme in many different ways. The clear design also means you can happily play this game on a mobile device. Symbols do react when you form a winning combination, so you are never in any doubt about any prizes you might have won. The pay table consists of eight pages. There are various football-related symbols here, including various shield designs featuring football boots, shirts and players. The game also has several types of wilds – the standard gold wild and two scoring wilds in red and blue. The scoring ones only appear in the free spins round. There is also an overlay wild which jumps from a gold wild into the space next to it, forming another wild. Meanwhile, the scatter is the gold trophy. 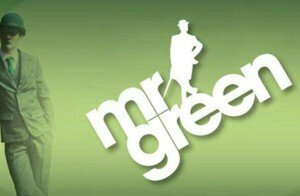 If you can get one of these on each of reels two, three and four, you can trigger some free spins to be played in this UK slot game. There is one other symbol in the Football: Champions Cup online slot, and that is the bonus symbol. At least three are needed to unlock the penalty shootout bonus round. You get five two-part rounds, so it’s not a short bonus at all. Firstly, you are the player and you pick a spot in the goal to try and score. Next, you’ll be the goalkeeper and the idea is to try and save the goal to win. This is one complete round. In addition to this, you can play in the Free Spins Tournament as well. Remember, you need three scattered trophies to access this part of the game. You only get four free spins at most, but while that doesn’t sound like a lot, it actually lasts longer than you might think. This is because the tournament starts in the round of 16. The idea is to get through each round and to eventually win the final. If you do this, you will win the biggest prize. It’s difficult to explain but hopefully you will get a shot at playing it for real. 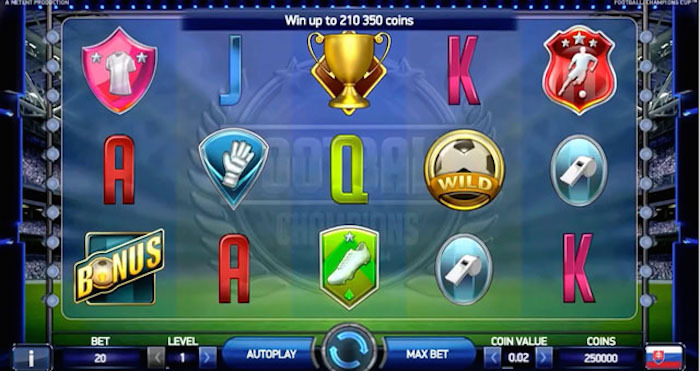 You can choose from a variety of coin sizes when you decide to play this footballing slot from NetEnt. They allow bets from one penny per line, making 20p the lowest bet you can place to play them all. For big spenders, the chance is there to play up to £100 per spin as well. As is common in many online slots, you can just click the ‘max bet’ option to select this bet if you like. All the betting amount controls are spaced along the bottom of the screen. The RTP appears to be in the region of 96.82%, but since this game has only just been released (the day before this review was written) there is a chance this could change slightly. The good news is the game offers some nice prize potential in the main game, while also offering bigger prize opportunities in both the bonus round and the free spins tournament. According to the main screen that loads at the start, there is a chance to scoop as many as 210,350 coins on the game. This is a new release so it’s a little early to tell whether football fans will love it as much as the real Euro 2016 action that is about to begin. But hey, if you love your online slots and you do happen to be a football fan, this could be a good addition to the regular slot games you play. NetEnt has worked hard to ensure the footballing them has been used well in all areas of the game, which means we can forgive them the addition of some dull symbols (K, Q, A and so on, we’re looking at you). The glossy and dynamic nature of the game is, in our opinion, a winner.